We love to cook outside on the grill during spring and summer. For some reason, we tend to overestimate the amount of steak needed to feed our family and we end up with leftovers. While just plain, left-over steak reheated in the microwave tastes great, sometimes I need to get creative and figure out another way to use up the cold steaks sitting in our fridge. 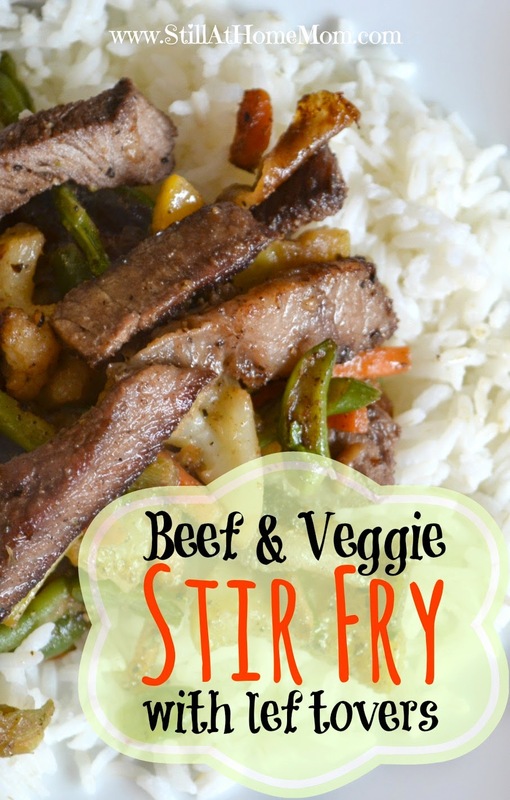 The other day, I came up with a quick and delicious stir-fry that the whole family loved. If you have leftover steaks, this will only take about 15 minutes! And it's so good that it's worth just grilling some extra steaks during a cookout to have ready for a meal later in the week. This is an easy supper to throw together on a busy night. Quick tip: Save medicine cups for measuring small amounts of liquids! 1. Heat oil in large skillet over high. When oil is hot, add sliced steak. Sprinkle lightly with Kosher salt and fresh-ground pepper. Stir and cook in hot oil until heated through. Remove from skillet onto a plate. 2. Add frozen veggies to skillet and stir to coat with oil and drippings. Add remaining ingredients and mix well. Cook and stir over high heat for 5-6 minutes, until heated through and crisp-tender. Do not overcook. Add steak back to skillet with veggies. 3. Serve alone or with steamed rice. Yield: 3-4 servings without rice; 4-5 servings if served with rice. Nightowl by nature, brightowl by choice. I am a mother, daughter, grandma, wife, sister, friend, and perpetual student of life. I take care of house and home while conquering my inner nightowl, one day at a time. Please come visit me at my new blog, www.StillAtHomeMom.com!